San Antonio shooting: Gilbert Flores has arms apparently raised, is shot by Bexar County sheriff’s deputies in disturbing cell phone video. Gilbert Flores appears to have arms raised. Via ABC affiliate KSAT 12. Two Texas police officers were recorded on a cellphone video shooting and killing a man who appeared to have his arms raised. The footage shows the fatal shooting of 41-year-old Gilbert Flores by Bexar County sheriff’s deputies Greg Vasquez and Robert Sanchez in San Antonio on Friday, the New York Times reports. 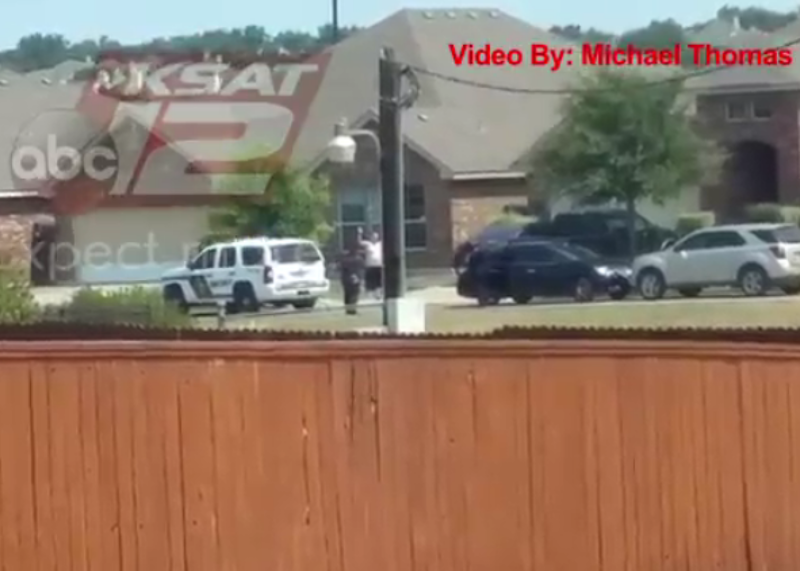 In the full graphic video, released by ABC affiliate KSAT 12 and shot by a local college student named Michael Thomas, Flores is seen fleeing as the two officers approach him with weapons apparently drawn. He then approaches them with his arms out wide before backing away again. Finally, he moves back towards the officers, stops, and appears to put his arms up (the view of one arm is obstructed by a pole). That is when the officers fire. Flores was the suspect in a domestic disturbance call in which police reported an 18-month-old baby appeared injured and a woman was found with a cut on her head, according to Bexar County Sheriff Susan Pamerleau. Pamerleau said in a press conference on Friday that the shooting occurred after a lengthy confrontation in which Flores reportedly resisted arrest and officers failed to subdue him using non-lethal force, including a Taser and shield. The officers had been with the department for more than ten years and have been placed on administrative leave according to the office’s standard procedure. The sheriff’s office was investigating the shooting and the FBI said it was monitoring the situation. County judge Nelson Wolff also indicated the video was cause for alarm.